Lock in a great price for Motel One Berlin Mitte – rated 8.6 by recent guests! Fast check-in and check-out! Friendly staff. Clean and nice interior. Overall good value for money. great concept! -- excellent facilities @ right price. Loved the room, bed, bathroom and the big window that opens up. It was a quiet room which we appreciated and everything was clean and pristine. Very good location if you are looking to party as the hotel is right next to all major Berlin’s club. Great value for the price you pay, a real bargain!! Beds and decor and the bar staff who made me a cocktail at 2am!! Staff was really nice and the accomodation was nice too. Definitely worth visiting it again. Location was good, literally outside the metro station and everywhere we wanted go (bradenberg gate, holocaust memorial, east side gallery, the wall museum and finally Neukölln ) were all about 20 mins away by metro. Berlin is big so wherever you stay you’ll be going by metro to get somewhere. This was good value for money compared to more central hotels (but staying more central would mean a longer metro ride to other areas!). The bed was really comfy, and the bar / lobby was dreamy. Motel One Berlin Mitte This rating is a reflection of how the property compares to the industry standard when it comes to price, facilities and services available. It's based on a self-evaluation by the property. Use this rating to help choose your stay! This modern hotel features stylish accommodations and free Wi-Fi in the lively Kreuzberg district of Berlin. 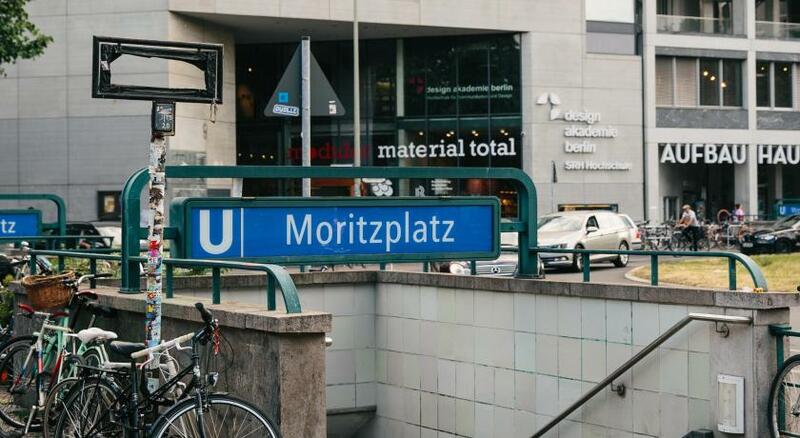 The Motel One is just steps from Moritzplatz Subway Station. As a guest at the Motel One Berlin Mitte, you can look forward to air-conditioned rooms equipped with a flat-screen TV and a granite-finish bathroom with a rain shower. After an eventful day, take it easy in the hotel’s One Lounge, which combines a reception, a breakfast cafe and a bar. The One Lounge serves a range of beverages and snacks 24 hours a day. Popular attractions such as Checkpoint Charlie, the Potsdamer Platz entertainment district and the Jewish Museum can be reached in minutes with the subway. When would you like to stay at Motel One Berlin Mitte? Stylish, air-conditioned room equipped with a flat-screen TV, and a private bathroom with a rain shower and hairdryer. House Rules Motel One Berlin Mitte takes special requests – add in the next step! Motel One Berlin Mitte accepts these cards and reserves the right to temporarily hold an amount prior to arrival. Requests to front desk haven't been completely followed up. Air conditioning system looks old style and one doesn't understand if the desired setting works or not Found my pyjama on my suitcase - that's not clean! The construction in the hall outside my room was annoying when I was trying to work but I appreciated that it started late morning after breakfast so it did not disturb my sleep. I love the room and everything about it. Bed was so comfortable and the TV with fireplace is hilarious and amazing at the same time. The chair and desk were perfect when I had to work; it is a comfortable chair. Extra points for the environmental details; it is amazing that there are no tiny plastic packaged bathroom products that end up being thrown away after one time use and that there are paper cups with a paper top instead of plastic cups. Love everything about this place. The stairways and lift area smelt funny - there was some work going on so it may have been that but it was very unpleasant! Literally no nice looking bars or restaurants within a 5 min walk of the hotel, didn’t bother us but some might not like that. Breakfast could have a few more choices and is a little exspensive for what it is. Clean and modern. Great shower. Friendly staff. While directly located to a subway station, this line does not easily connect you to the main city centre. The hotel is just around the corner to Kreuzberg, which is great.